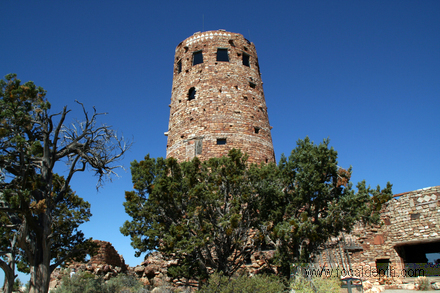 The Desert View Watchtower, constructed in 1932 as a replica of a prehistoric Indian tower, commands a magnificent view of the Grand Canyon, the Painted Desert to the east and the San Fransico Peaks to the south. This seventy-foot tower is the highest point on the South Rim. The interior walls of the tower feature murals by Hopi artist Fred Kabotie.